Is the Light Heavyweight Boxing’s Hottest Division? Earlier this month, Sergey “Krusher” Kovalev (33-3-1, 28 KOs) regained his WBO title from Eleider Alvarez (24-1, 12 KOs) in a one-sided victory. 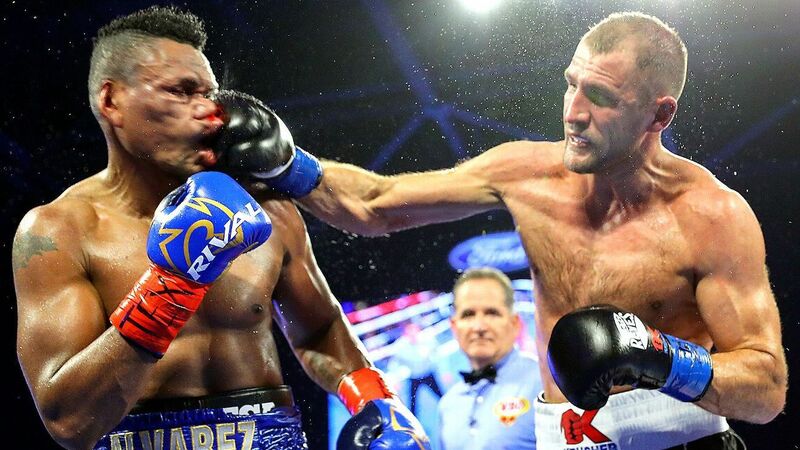 After being viciously knocked out by Alvarez last year, Kovalev proved his ability to bounce back, outboxing Alvarez through the course of 12 rounds. He looked like a new fighter under coach Buddy McGirt, fighting patiently behind the jab, and pacing himself to avoid being exposed in the later rounds. With the victory, Kovalev once again established himself as one of the best fighters in the light heavyweight (175 lbs) division. In the post-fight interview, he called for a unification fight, and lucky for boxing fans, a fight against the other champions would surely be fireworks. Currently, the light heavyweight division is stacked and easily one of the sport’s best. From the WBC champ, to the IBF champ, the division is filled with savages roaming around. Oleksandr “The Nail” Gvozdyk (16-0, 13 KOs) recently stopped long-time champion, Adonis “Superman” Stevenson (29-2-1, 24 KOs), to become the new WBC Champion. A smart and technical boxer, Gvozdyk is yet another Ukrainian fighter who has had a major impact on the boxing scene, joining the likes of Vasily Lomachenko (12-1, 9 KOs) and Oleksandr Usyk (16-0, 12 KOs). Apart from his highlight victory against Stevenson, Gvozdyck also holds victories over Yunieski Gonzales (18-3, 14 KOs), Isaac Chilemba (25-6-2, 10 KOs) and Nadjib Mohammedi (40-7, 23 KOs), compiling a record of 16-0, 13 KOs. Gvozdyk is currently promoted by Top Rank which promotes its events on ESPN, the network Kovalev just fought on. A possible fight between the two would be highly anticipated. Hailing from Tokmok, Kyrgyzstan, Dmitry Bivol (15-0, 11 KOs) is currently the WBA “Super” World Champion. Coming off a win against Jean Pascal (33-6-1, 20 KOs) last November, Bivol has compiled a record of 15-0-11 KOs. A smart boxer puncher, Bivol has solid victories over the previously mentioned Pascal, as well as Isaac Chilemba and Sullivan Barrera (22-2, 14 KOs). He is scheduled to face power-puncher Joe Smith Jr. (24-2, 20 KOs) on March 9th. Should Bivol get past Smith, big fights against the other champions await the 28-year-old. A few years ago, Artur Beterbiev (13-0, 13 KOs) was one of the hottest prospects in boxing. With vicious power in both hands, Beterbiev made his name by knocking out solid fighters such as Tavoris Cloud (24-3, 19 KOs) and Gabriel Campillo (25-8-1, 12 KOs). His hype then began to dwindle due to promotional issues. He has only fought twice in the last 2 years; winning the IBF light heavyweight title against Enrico Koelling (26-3, 8 KOs) in 2017 and knocking out Callum “The One” Johnson (17-1, 12 KOs) in October of last year. Beterbiev himself was knocked down in that fight, and rallied back to defend his title. He currently has a record of 13-0, 13 KOs , but at 34 years old, he does not have many years left in the sport. Currently signed to DAZN, it will be interesting to see if that plays a factor in his chances of getting a unification fight. A fight against Kovalev, whom Beterbiev has defeated twice in the amateur, would be particularly interesting due to the animosity between them. Last but not least, Sergey Kovalev is the current WBO world champion after putting on a masterclass against Eleider Alvarez earlier this month. For many years, Kovalev was considered the best light heavyweight in the world, defeating the likes of Nathan Cleverly (30-4, 16 KOs), Bernard Hopkins (rtd.) and Jean Pascal. He looked unbeatable until he faced future hall of famer, Andre Ward (rtd. ), in one of the most anticipated light heavyweight fights of all time. Kovalev was defeated twice by Ward, bounced back with victories over B-level competition, and was then knocked out by Eleider Alvarez. Kovalev then avenged the defeat where he looked like a rejuvenated fighter. Currently 35 years old with a record of 33-2, 28 KOs, Kovalev seems eager to have a unification fight before his career comes to a close. The light heavyweight division is the best it has been in recent memory. Apart from the four main champions, other fighters such as WBA “interim” champion Marcus Browne (23-0, 16 KOs), await their chance to claim the light heavyweight throne. There have also been rumors of super middleweights Gilberto “Zurdo” Ramirez (39-0, 25 KOs) and Callum Smith (25-0, 18 KOs) moving up to the light heavyweight division as they are massive for the 168 pound division. Should they decide to do that, the light heavyweight division would become even more stacked than it already is. The number of high-profile match-ups in the light heavyweight division is voluminous. Now whether we actually get to see those fights or boxing politics prevents them from happening remains to be seen.